Start this unique journey atop Table Mountain where the views of Cape Town are breathtaking. Admire white sandy beaches lapped by the waters of the Atlantic and head south to where two oceans meet at Cape Point. An artisan encounter reveals the craft culture of the country before you board Rovos Rail for a luxury rail journey from winelands to waterfalls. Marvel at the “smoke that thunders” before a river safari on the Chobe River aboard a boutique floating hotel. The Okavango Delta provides the grand finale to your safari where lodgings are at the outstanding Sanctuary Chief’s Camp where safari chic is elevated to a new level and wildlife sightings are second to none. Recapture the romance of a bygone era as you board the wood-paneled coaches of the luxurious Rovos Rail. Depart Cape Town Station as you settle into your suite featuring a sitting area, an en suite bathroom, and the perfect blend of period ambience and modern amenities. Wind through mountains, rolling green hills and the Cape Winelands before stopping to visit Matjiesfontein, an authentically preserved Victorian village. Sip South African vintages in handsome dining cars serving up artful menus as the stunning scenery scrolls by. The next day, gain another perspective from the Observation Car at the rear of the train. In Kimberley, tour the Diamond Mine Museum and take the opportunity to see one of the world’s largest handdug excavation sites. Continue through the hauntingly barren Great Karoo and the grasslands of gold-rich Highveld, marveling at the changing landscapes. After breakfast and views of the gold fields of Witwatersrand, arrive at Pretoria Station. Transfer to your hotel in the suburbs of Johannesburg, where you enjoy lunch before an afternoon at leisure. Rest and relax or enjoy the amenities of your accommodations. Fly to Victoria Falls, where you transfer to your beautiful hotel. This afternoon, set sail on a Scenic Sundowner cruise on the Zambezi River, watching for the rising mist of the falls in the far distance while you sip a refreshing cocktail. Spot hippos, crocodiles and a variety of birds as you gently glide along. Join your guide for a private walking tour on the Zimbabwean side of Victoria Falls, known locally as Mosi-oa-Tunya (“The Smoke That Thunders”). Watch as the mile-wide Upper Zambezi plunges over 300 feet into the Lower Zambezi, making rainbows form and fade in the mist. Time permitting, enjoy a market visit, browsing stalls filled with local handicrafts. Later, relax on a drive to Kasane, where you pass through Namibian customs before boarding five-star ‘Zambezi Queen.’ Enjoy the sunset river views on this elegant, uniquely African vessel while sipping cocktails and sampling canapés. Watch as elephants, buffalo and monkeys come to the river’s edge to drink. On board tonight, enjoy a beautiful dinner prepared by the resident chef, who shares a meal that matches the majesty of your surroundings. After breakfast, disembark ‘Zambezi Queen’ and fly to the Okavango Delta via Kasane Airport. Arrive at Sanctuary Chief’s Camp, in the Mombo Concession of the vast Moremi Game Reserve. This area is considered the “Predator Capital of the World” and is home to the “Big Five.” It offers Botswana’s most exciting game viewing, with a lush delta that draws a remarkable concentration of birds and wildlife. The rest of your day is at leisure to enjoy the activities on offer. Rise early for a game drive on the reserve, where the game viewing is magnificent. Large concentrations of elephants, buffalo and impalas as well as lions and other predators call the Okavango home. Activities include a seasonal mokoro ride on the delta and a Chef’s Table experience offering you a taste of traditional local cuisine. Meet with our local A&K Philanthropy Coordinator to learn more about the Rhino Conservation Program, a bold initiative supported by AKP and Sanctuary Retreats in partnership with the Botswana Defense Force and other local organizations, which has to date relocated 20 rare and endangered rhinos from South Africa to Moremi Reserve to protect them from poachers. Then, set out on your afternoon safari. Tonight, celebrate with a special farewell dinner. 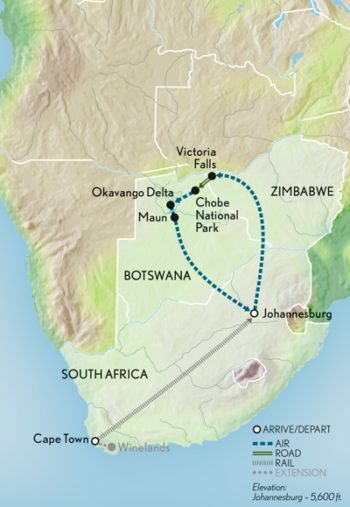 Fly to Johannesburg via Maun, where you connect with your international flight home. Compliments of A&K, enjoy access to the comfortable Premier Lounge before your departure. August 09 departure will operate with slightly revised routing and sightseeing. Please contact A&K for details.